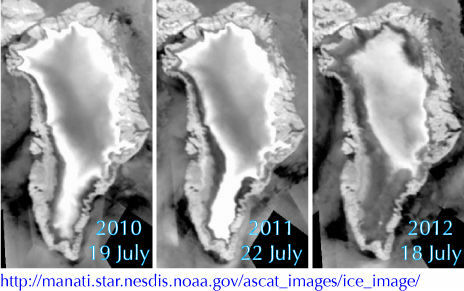 The combination-image below shows how much the ice on Greenland melted between July 8 (left) and July 12 (right). On July 8, about 40% of the ice sheet had undergone thawing at or near the surface. In just a few days, the melting had dramatically accelerated and some 97% of the ice sheet surface had thawed by July 12. In the image, the areas classified as “probable melt” (light pink) correspond to those sites where at least one satellite detected surface melting. The areas classified as “melt” (dark pink) correspond to sites where two or three satellites detected surface melting. The satellites are measuring different physical properties at different scales and are passing over Greenland at different times. Credit: Nicolo E. DiGirolamo, SSAI/NASA GSFC, and Jesse Allen, NASA Earth Observatory. 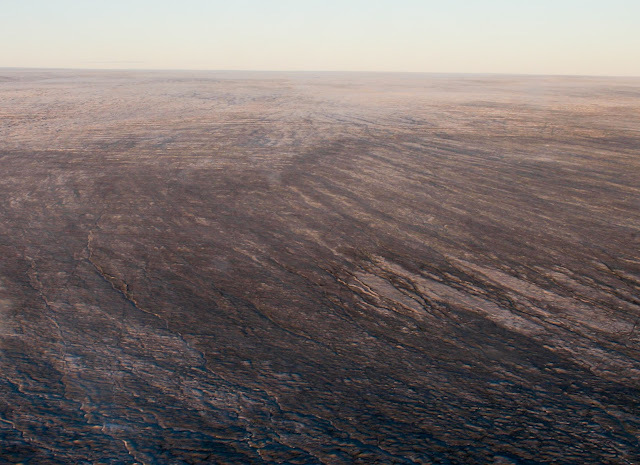 On average in the summer, about half of the surface of Greenland's ice sheet naturally melts. At high elevations, most of that melt water quickly refreezes in place. Near the coast, some of the melt water is retained by the ice sheet and the rest is lost to the ocean. But this year the extent of ice melting at or near the surface jumped dramatically. According to satellite data, an estimated 97% of the ice sheet surface thawed at some point in mid-July. 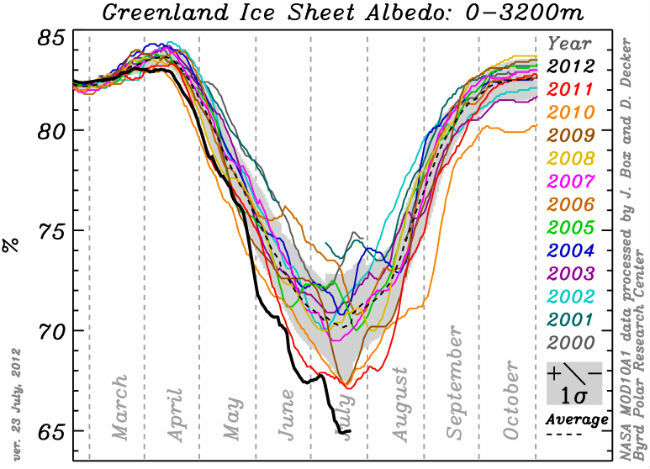 As the ice warms, it loses albedo, i.e. less sunlight is reflected back into space. Darker surface absorbs more sunlight, accelerating the melting. 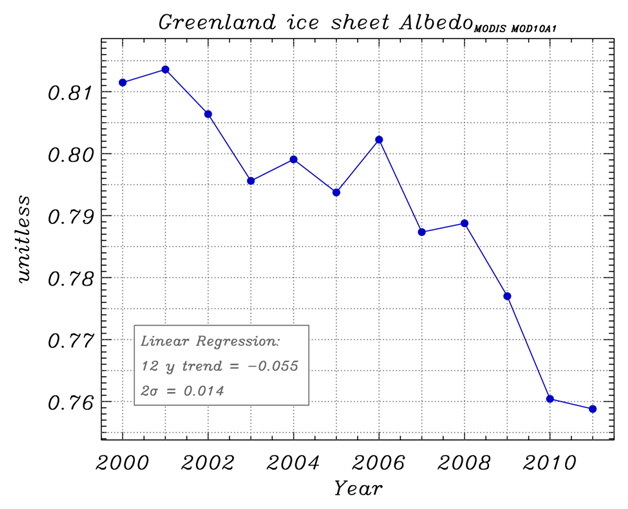 The image below shows the Greenland ice sheet albedo from 2000 to 2011.
Credit: NOAA Arctic Report Card 2011. The image below, from the meltfactor blog and by Jason Box and David Decker, shows the steep fall in reflectivity for altitudes up to 3200 meters in July 2012. The image below, from the meltfactor blog, shows how the year 2012 compares with the situation at approximately the same time in previous years, 2011 and 2010, which are recognized as being record melt years. The photo below shows how dark the ice sheet surface can become. Loss of albedo occurs as the darker bare ground becomes visible where the ice has melted away. Darkening of snow and ice can start even before melting takes place. Warming changes the shape and size of the ice crystals in the snowpack, as described at this NASA Earth Observatory page. As temperatures rise, snow grains clump together and reflect less light than the many-faceted, smaller crystals. Additional heat rounds the sharp edges of the crystals, and round particles absorb more sunlight than jagged ones. Dirty ice surrounds a meltwater stream near the margin of the ice sheet. Compared to fresh snow and clean ice, the dark surface absorbs more sunlight, accelerating melting. © Henrik Egede Lassen/Alpha Film, from the Snow, Water, Ice, and Permafrost in the Arctic report from the U.N. Arctic Monitoring and Assessment Programme. From NOAA Climatewatch. Another factor contributing to darkening is aerosols, in particular soot (i.e. black carbon) from fires and combustion of fuel, dust and organic compounds that enter the atmosphere and that can travel over long distances and settle on ice and snow in the Arctic. The July data since 2000, from the meltfactor blog, suggest a exponential fall in reflectivity that, when projected into the future (red line, added by Sam Carana), looks set to go into freefall next year. Is a similar thing happening all over the Arctic? Well, the map below, edited from a recent SSMIS Sea Ice Map, shows that sea ice concentration is highest around the North Pole. So, can water be expected to show up at the North Pole? 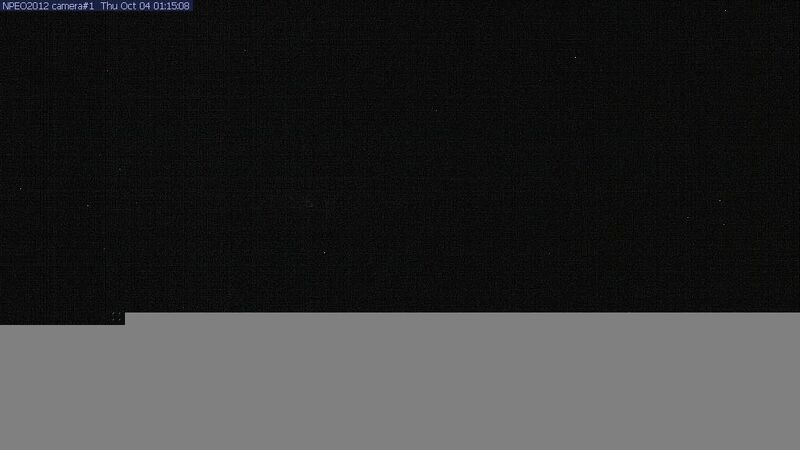 Well have a look at the photo from the North Pole webcam below. It does look like melting is going on at the North Pole. Water is significantly darker than ice, meaning the overall reflectivity will be substantially lowered by this water. It's important to realize that surface albedo change is just one out of a number of feedbacks, each of which deserves a closer look. 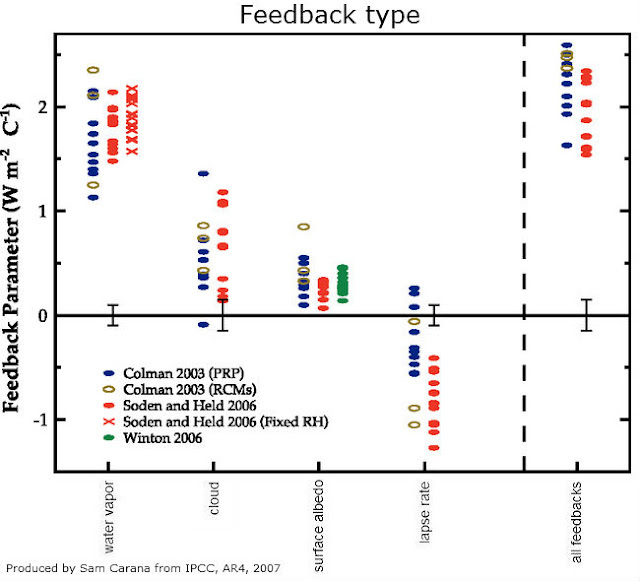 As shown on the image below, the IPCC describes four types of feedbacks with a joint Radiative Forcing of about 2 W/sq m, i.e. water vapor, cloud, surface albedo and lapse rate. The image below, from James Hansen et al., may at first glance give the impression that all aerosols have a cooling effect. When components are split out further, it becomes clear though that some aerosols are reflective and have a cooling effect, whereas black carbon has a warming effect, while changes in snow albedo also contribute to warming. On the interactive graph below, you can click on or hover over each component to view their radiative forcing. When isolated from other factors, it's clear that snow albedo has an increasing warming effect. How much could Earth warm up due to decline of snow and ice? Professor Peter Wadhams estimates that the drop in albedo in case of total loss of Arctic sea ice would be a 1.3 W/sq m rise in radiative forcing globally, while additional decline of ice and snow on land could push the the combined impact well over 2 W/sq m.
Locally, the impact could be even more dramatic. 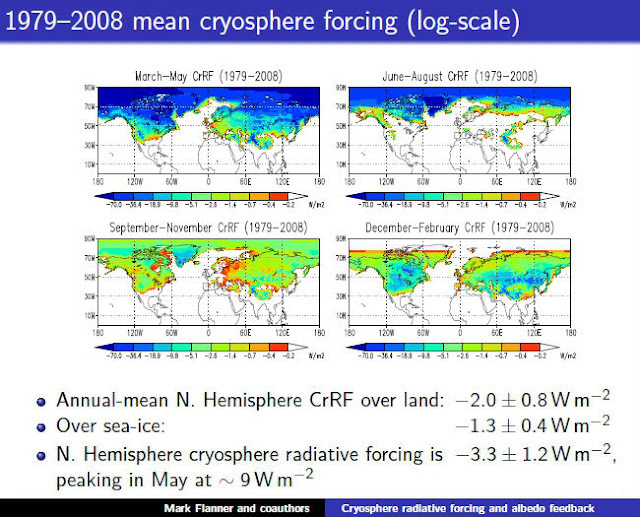 The image below, from Flanner et al., shows how much the snow and ice is cooling the Arctic. Image, edited by Sam Carana, from Mark Flanner et al. (2011). 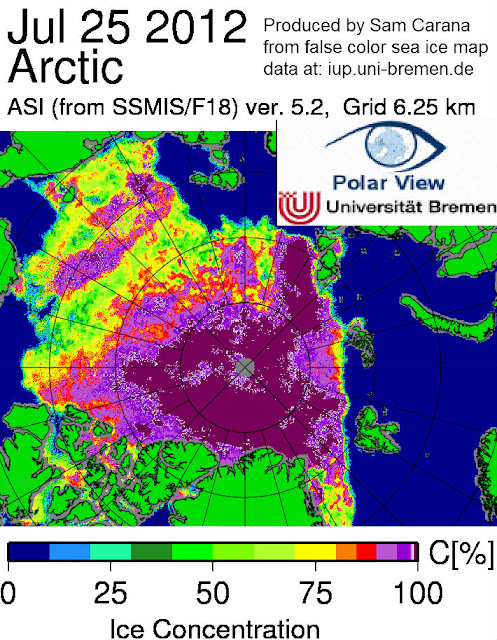 Conversely, above image shows how much the Arctic could warm up without the snow and ice. Due to albedo change, sunlight that was previously reflected back into space will instead warm up the Arctic. What could have a big impact locally is that, where there's no more sea ice left, all the heat that previously went into melting will raise temperatures instead, as described at Warming in the Arctic. The big danger is methane. Drew Shindell et al. 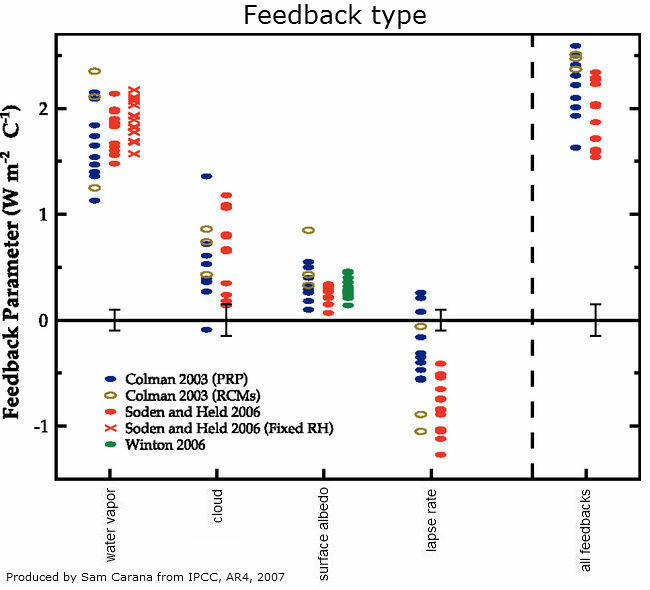 show in Improved Attribution of Climate Forcing to Emissions that inclusion of aerosol responses will give methane a much higher global warming potential (GWP) than the IPCC gave methane in AR4, adding that methane's GWP would likely be further increased by including ecosystem responses. 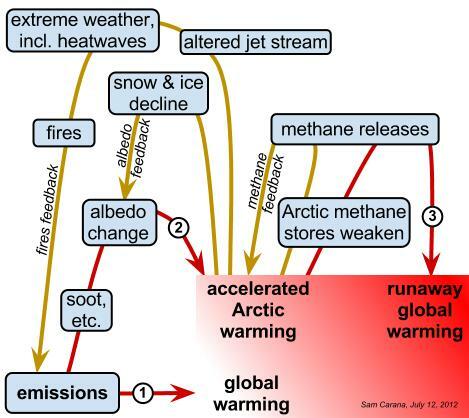 Indeed, as pictured in the image below, accelerated warming in the Arctic could trigger methane releases which could cause further methane releases, escalating into runaway global warming. Hardly the "good lord's" fault. It's ours. great stuff Sam! my question concerns what fraction of the energy wil go to melt the GIS as the ice free period increases. 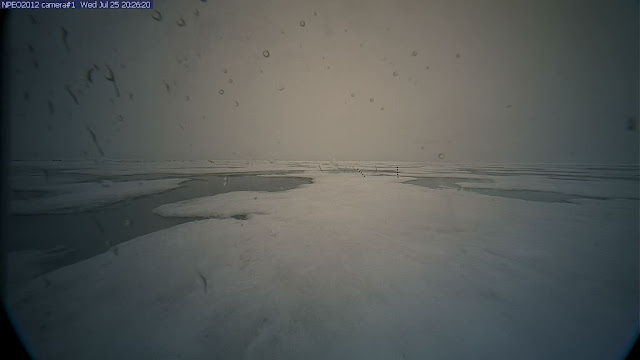 ( I assume that we are going to have a seasonal coverage in the arctic for a long time in the future. However, hte melt time for the GIS could be measured in hundreds of years rather than thousands if say half the energy that now goes to melt sea ice went to melt the GIS. Good question, Hugh. 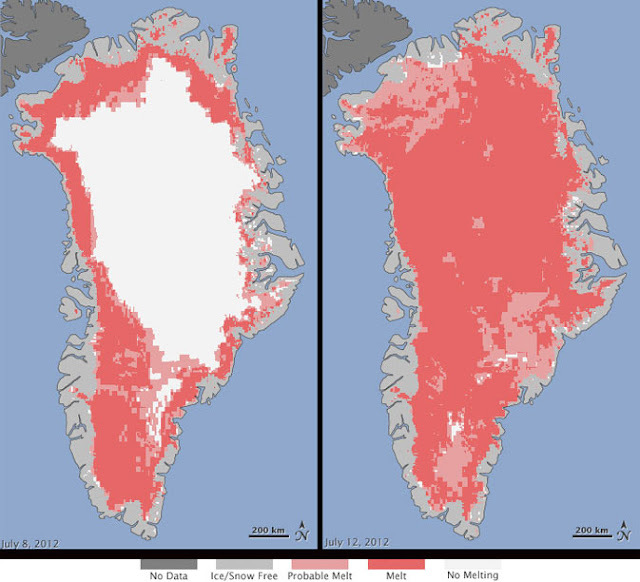 The ice on Greenland now acts as an important buffer, moderating seasonal temperature differences and masking the full brunt of global warming. A huge amount of energy now goes into melting the ice on Greenland in summer, consuming energy that would otherwise heat up Arctic waters and atmosphere. Note though that the increasing amounts of meltwater already do contribute significantly to warming up subzero waters (and hydrates). How does ice turn into water when heated up? As long as ice is below 0°C, 2.06 J/g of the energy goes into every degree Celsius that the temperature of the ice rises. As the ice starts melting (at 0°C), all energy (at 334J/g) goes into changing ice into water, while the temperature will remain at 0°C (273.15K, 32°F). 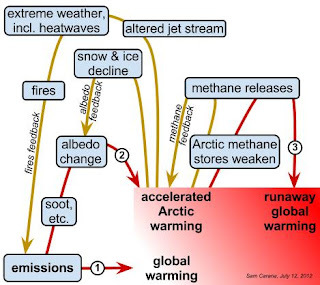 Once all ice has turned into water, all energy will go into heating up the water, at 4.18 J/g for every degree Celsius that the temperature of water rises (see image at http://arctic-news.blogspot.com/p/warming-in-arctic.html). The amount of energy that the ice consumes is not constant. As the post describes, over 70% of sunlight used to be reflected on average in July, but in July 2012 albedo declined to about 65%. In other words, 5% more of the sunlight's energy is now consumed by the ice. 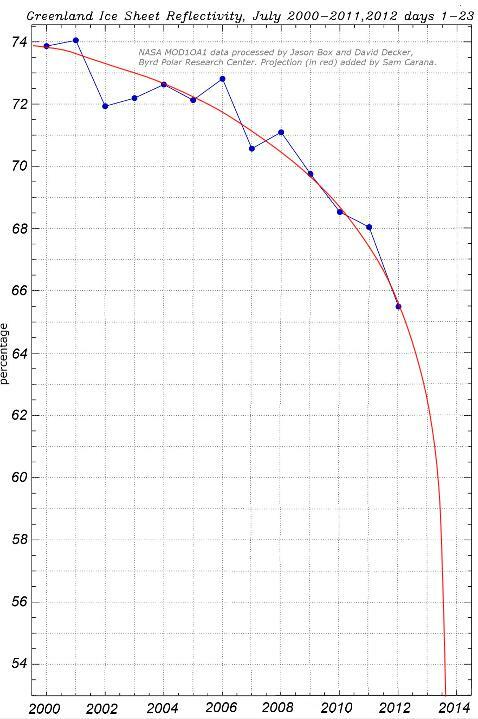 As albedo decline progresses, an ever greater part of sunlight will be absorbed, a feedback that creates a vicious cycle, which is one reason why I added the exponential fall of albedo over time that looks set to go into freefall over the next few years. What will further accelerate Greenland's melt is the Arctic Ocean's summer sea ice retreat (or collapse) towards virtually zero within a few years. The resulting albedo change will mean that a lot of sunlight that was previously reflected back into space will instead warm up the Arctic, including the atmosphere above Greenland. Sam, I'm hardly a climatologist, but there seems to be a synergy building up there that I really don't like. We have direct ice absorption of heat energy, the feedback as the ice approaches and changes to water, the loss of albedo from reduced ice and snow cover, and the methane releasing that's already occurring and multiplying the greenhouse gas effects already present because of CO2 concentration increase. Worse, the methane is a far more effective GHG than CO2. My question is, "Since the denialists have pretty much put the blocks to any effective international, or even national, government action... what can we do that will be of any real effect?" A lot can be done at local and state levels. An example for transport is vehicle registration fees, which can be made dependent on the respective vehicle's emissions, i.e. higher fees for high emissions, with the extra revenues funding rebates on the registration fees for vehicles with low emissions. Similarly, emissions caused by buildings and land (e.g. soil carbon content changes and other changes caused by agricultural practices) can be incorporated in local rates. At state level, fees on fuel could fund clean energy and transport electrification programs (e.g. high speed rail and electric buses). Similarly, fees can be imposed on other polluting products, with revenues used to fund (preferably local) rebates on clean alternatives. But you're right, more action is also needed globally. One of the most important things to do is to vote for those who do want action to be taken and to let your representatives know of your voting intentions.